Although protons and neutrons do not seem to have any "direction," they actually do. The "direction" is determined by the rotation on its axis. We can define left and right by using this rotation. The rotation of an elementary particle is called "spin." Laws of nature had been believed to be symmetric with respect to "left" and "right." In other words, the physical laws in a mirror world are thought to be the same as in our world. In 1956 Professor. T.D. Lee of Columbia University, the Director Emeritus of RIKEN BNL Research Center, published a shocking prediction of the possibility that the mirror world might be different from ours. This was immediately verified through experiments, and Prof. Lee was awarded the Nobel Prize in Physics the following year together with Prof. C.N. Yang of the State University of New York at Stony Brook. In this confirmation experiment, “spinning” nuclei were used to distinguish “left” and “right” in order to reveal that the mirror world is not the same as the world we live in. As this example suggests, spin plays an important role in determining “left” and “right” in space. The nucleon consists of three quarks and gluons which glue the quarks together. Various properties of the nucleon have been explained by the properties of quarks. For example, a proton’s electric charge (+1) is explained by means of the sum of 2 up quarks with +2/3 of electric charge and 1 down quark with -1/3. It has been generally accepted that the proton’s spin could be naturally explained by quark spin. However, experiments conducted at the European Laboratory for Particle and Nuclear Physics (Conseil Europeen pour la Recherché Nucleaire, CERN) in the later 1980s showed that the total of quark spins was less than the total spins of protons. This was called “the proton spin crisis,” and was an event in modern particle and nuclear physics. Therefore, it is important to solve the puzzle of “What is carrying the remaining spin?”. 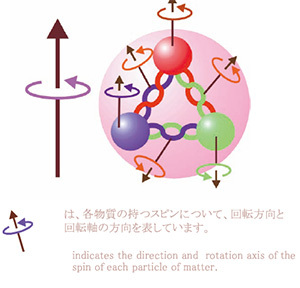 Research on spin at the RIKEN BNL Research Center (RBRC) includes a theoretical computation process called Perturbative QCD by means of a reliable computing method. Also, RBRC’s researchers aim to experimentally measure the spins, especially those of gluons, so that they may achieve a more detailed understanding of the nucleon structure.